Faculty of Dental Medicine, Medical University, Sofia, Bulgaria. The purpose was to assess the knowledge of dental students of the ergonomics’ principles and how they develop adequate skills to work safe in clinic. Methods: A questionnaire, comprising a set of 25 close-ended questions and 2 open-ended questions to rate the knowledge, attitude and motivation regarding the good posture, training environment and real clinical practice’ organization, was distributed among 260 from a total of 685 dental students. Demonstration of proper working posture and training in it had been given to 4-th and 5-th year’ students. The process was registered by photos. Data were treated statistically using SPSS. 16.1. Results: Most of students report they know the right working posture (52,6%) or “have an idea” (36,6%). Almost all of them are persuaded it is important to work in good posture (95,9%). They would like to be trained in ergonomics (96,4%), and think it should be done before graduation (90,2%). Students agree on integrating ergonomic training into the clinical training and think it is possible (73,6%). The students originating from “dental” families demonstrated higher interest in ergonomics. The photos taken before the training showed that knowledge without practice is not stable. Conclusion: The students understand the importance of the practical application of the dental ergonomics principles. Registering skills is an important education tool. The findings of the research support the argument for integrating ergonomics in clinical studies. Key words: dental ergonomics, logistic training, dental education, professional health of dentists. Please cite this article as: Katrova LG, Ivanov I, Ivanov M, Pejcheva K. “Ergonomization” of the working environment and building up of healthy working posture of dental students. J of IMAB. 2012; 18(4):243-250. doi: 10.5272/ jimab.2012184.243. 1. SmartTec. Musculoskeletal disorders: their symptoms and possible causes. Smartpractice; 2002. 3. Boyd MA. Performance Logic in Clinical Dentistry, Center for Human Performance in Dentitsry. The application of performance logic in Dental Education and Practice The performance simulation laboratory, The University of British Columbia Vancouver, B.C. Canada, 1994. 5. Sunell S, Rucker LM. “Ergonomic Risk Factors Associated with Clinical Dental Hygiene Practice”, Probe 37(4):159-166, 2003. 8. Katrova L. Dental public health, dental profession, dental practice. “WINI 1893” Sofia. 2011. 319 с. ISBN: 978-954-9437-26-3. 11. Katrova L, Marinov M, Ivanov I. Maik Shoaib Assessment of dental students' knowledge on the application of ergonomics’principles in dental clinic; 27th Annual congress of the May 27-28. 2011, Biberach, Germany (poster). 15. Belenky MM, Rucker LM, Kawamura Y. 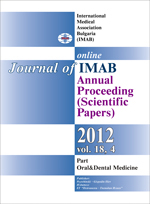 "Application of Numeric Terms and Performance Simulation in Dentistry", J. Int. Coll. of Dent. 17(1):103-116, 1986. 16. Brookhuis KA, Hedge H, Hendrick E. Salas and N. Stanton. Handbook of Human Factors and Ergonomics Models. Florida: CRC. 2005. 17. Delleman NJ, Haslegrave CM and Chaffin DB Working Postures and Movements. Tools for Evaluation and Engineering. Editors London, New York, Washington: CRC Press LLC, 2004. 18. FDI, Policy Statement, Musculoskeletal Disorders and Dental Practice Adopted by the FDI General Assembly: 26th October 2007, Dubai. 19. Kalheinz Kimmel, Robert Oswald Practising Dentistry, Ergonomic guidelines for the future, Berlin Chicago, Die Quintessenz, 1972. 22. Ergonomics and Disability Support Advisory Committee (EDSAC) to the Council on Dental Practice (CDP). An introduction to ergonomics: risk factors, MSDs, approaches and interventions. American Dental Association; 2004. 23. Grant KA. Ergonomics: is it optional? PowerPoint presentation. 24. Murphy DC. Ergonomics and the Dental Care Worker. American Public Health Association, United Book Press, Washington, DC;1998. 25. NIOSH. Work-related musculoskeletal disorders. 1997. 29. Werner RA, Hamann C, Franzblau A, Rodgers PA. Prevalence of carpal tunnel syndrome and upper extremity tendinitis among dental hygienists. J Dent Hyg. 2002 Spring;76(2):126-132. [PubMed].